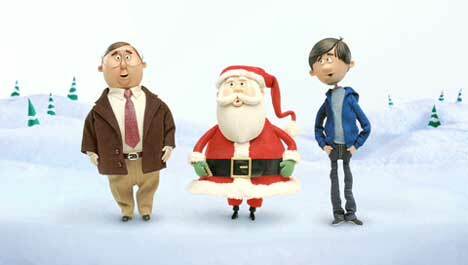 Apple continues the Get A Mac advertising campaign with an animated TV ad in which Santa Claus joins the two comedians in a computer-related version of the song, “Santa Claus is Coming”. PC (John Hodgman) and Mac (Justin Long) sing alternate lines until PC gets carried away and encourages viewers not to buy Macs. or any other time for goodness sake! The Get A Mac campaign was developed at TBWA\Media Arts Lab and was developed by chief creative officer Lee Clow, executive creative directors Duncan Milner and Eric Grunbaum, art director Chuck Monn, copywriter Jason Sperling and Alicia Dotter, agency producers Cheryl Childers, Hank Zakroff and Perrin Rausch. Animation was directed by Drew Lightfoot at LAIKA/house with director of photography John Nolan, with editors Steve Miller and Veronica Vichit-Vadakan.